CES wouldn't be the Consumer Electronics Show without a little Copycat, Emulate & Steal. This year's event showed off some of the tech industry's best ideas on how to make products that look as much as possible like Apple's as they attempt to transition from selling cheap commodity products to premium hardware that struggles to look designed in Cupertino. 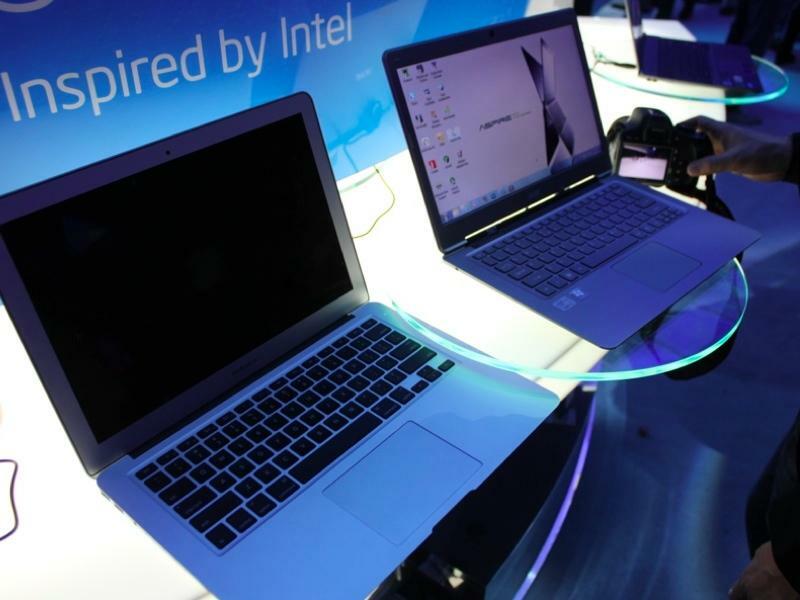 Ever since Apple released the MacBook Air, Intel's Ultrabook partners have been trying to crank out their own lookalikes that tiptoe toward flattery with their careful attention to copying every design cue they can, as we previously noted at CES 2012. Lenovo, the Chinese firm that bought IBM's PC business and more recently took over Google's struggling Motorola Mobility subsidiary, has doubled down on its portrayal of itself as a shadow of Apple in marketing photos that depict its laptops arranged exactly the way Apple portrayed its super thin new MacBook last spring. "Can you spot the difference?" tweeted Neil Cybart. LG and HP similarly introduced their own MacBook copies, with the LG Gram 15 (below left) taking Apple's design to a 15 inch screen in the same rose gold finish introduced by Apple last year. The new machine runs Windows 10 and sports more ports, but also claims only 7 hours of battery life despite being larger. HP's EliteBook Folio (above right) also introduced another Apple-inspired notebook design for CES 2016, hoping to upgrade its Windows PC customers used to paying on average around $300 to a high end MacBook alternative priced more like Apple at $999. HP has also tried to extricate itself from the cheap Android tablet business, and hopes buyers will return willing to pay more for tablets running Windows. Samsung is so familiar with studying Apple that it literally wrote a book (for internal use only) on how to examine Apple's work and then duplicate it down to the dot. However, after its iPhone copycat manual appeared in the Samsung infringement trial, the firm was left on the hook for paying $548 million, followed by a second jury award of $120 million, in two cases that accomplished little more than establishing, very publicly, how desperately Samsung looks to Apple for direction in the design of its smartphone and tablets. After all that embarrassment, you'd think Samsung would pursue at least mostly original designs for its other products. But its new TVs at CES were spotted showing off a direct clone of Apple TV 4 and its new tvOS interface, right down to the frosted white overlays and 16:9 channel app icons, as noted by John Gruber of Daring Fireball. At last year's CES, a Chinese knock-off firm Hyperdon showed off its counterfeit Apple Watch, although reviewers said the device "seemed incomplete and sometimes even useless." Last year marked 15 years of Apple upstaging CES, a history we recounted as a decade-and-a-half tour of Apple stealing attention from the industry, without even attending their party. The only way to steal that attention back from Apple seems to be to literally steal Apple's attention.